Those were the words of Juan Muñoz, an Indianapolis police officer that saved a victim of cardiac arrest using a technique he learned from an American Heart Association (AHA) Hands-Only CPR Training Kiosk only weeks before. 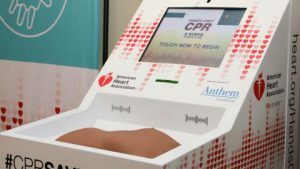 The kiosk, which was installed in 2016 at Indianapolis International Airport, offers a hands-on video tutorial on treating a victim suffering from cardiac arrest. Participants are tested on special manikins which monitor hand placement, compression rate and compression depth for proper CPR technique. If the user is performing the action incorrectly, the kiosk actively displays what the user needs to adjust to perfect the technique. 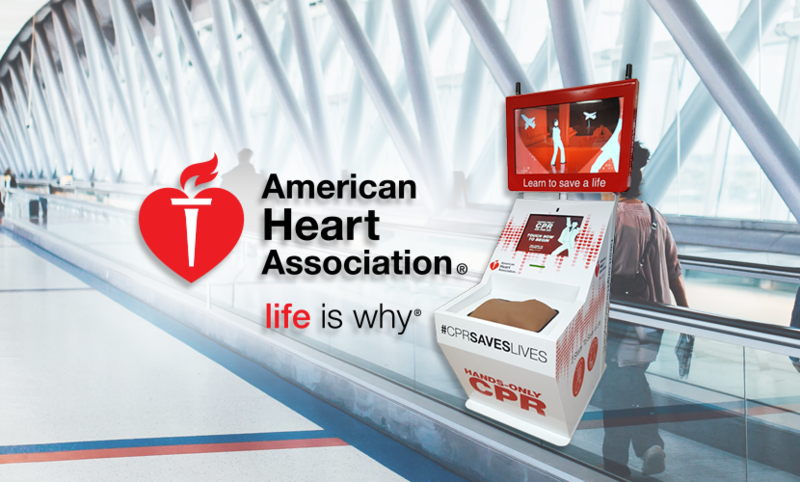 The AHA CPR Training Kiosk can be found in airports and other high-traffic locations across the country, with more on the way. 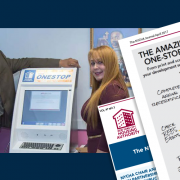 Following the proven success of the initial kiosks, AHA was motivated to expand the program. 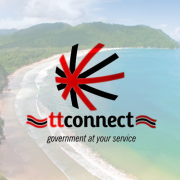 In June 2016, they initiated discussions with DynaTouch to optimize the kiosk enclosure design and enhance the user interface, as well as improve deployment procedures and support protocol in anticipation of installing more kiosks around the country. Since then, 12 additional kiosks have been installed at Carnegie Science Center (Pittsburgh, PA), Orlando International Airport, Cincinnati Museum Center, Cincinnati Airport, Dayton International Airport, University of Dayton, Cleveland Hopkins Airport, Philadelphia Independence Visitor Center, Lurie Children’s Hospital (Chicago, IL) and John Wayne Airport (Santa Ana, CA), with more deployments on the horizon. 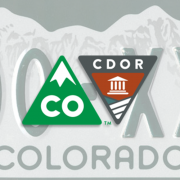 DynaTouch currently provides services to support the installed kiosk base and to supply/install/support all future kiosks. 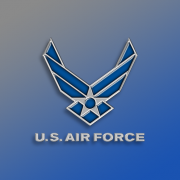 Recent improvements to the software include rebranding the user interface with more current graphics, videos, and audio tutorials. 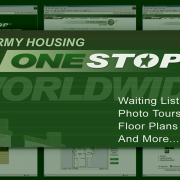 Spanish versions of the content have also been added to reach a wider audience. In addition, AHA filmed a promotional video with Matthew Lickenbrock, who saved the life of fellow University of Dayton student Sean Ferguson after learning Hands-Only CPR on an AHA kiosk in the DFW airport just days before. 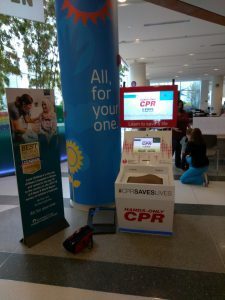 This video is now played on the kiosks when they are not in active use to help encourage passersby to approach and interact with the system to learn proper CPR. DynaTouch also created an administrative portal that gives AHA the ability to view graphs and reports on national usage trends, as well as individual sessions and tests. The data collected from the kiosks will help gauge the success of the project at every kiosk location. 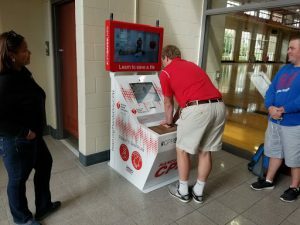 The American Heart Association is committed to saving lives by teaching kiosk users the correct techniques for adult and teen CPR. DynaTouch is dedicated to helping AHA maximize the effect and reach of this impactful project. 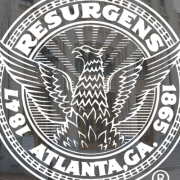 To learn more about the AHA Hands-Only CPR Kiosk Program, click here. CNN.com and CNN Airport Network: CPR kiosks…learn to save a life in 5 minutes!